Wow... 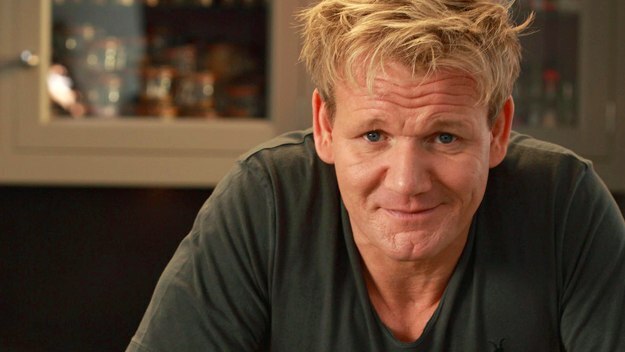 I find myself absolutely riveted by Gordon Ramsay's show "Ramsay's Ultimate Cookery Course". He's such a fascinating chef.... clearly he knows his stuff... and when I watch "Hell's Kitchen" or "Kitchen Nightmares" I'm always thinking "wow... I would be so scared of him.... I don't know how anyone could question his expertise. And when people invite him to come and save their restaurant, why are they always shocked and offended when he tells them, basically, their food is horrible??? Anyhow... I ran across this show, and I can't turn it off. It's such a different side of Ramsay. He's so calm and every step is very calculated and exact. His tone of voice is very professional and almost soothing. Who knew he could have such an inviting tone to his personality? I watched a biography about him a few weeks ago... his story is pretty amazing. I was stuck, however, on the fact that I learned he is one year younger than me. I have always thought of him as older... not a lot but at least a few years. Can't decide if it's my own vanity and denial of my own aging... or if it's his passion and expertise that makes me just assume he must have much more life experience than I. Regardless... it's a very fascinating show... he's almost got that "Barefoot Contessa" Zen about him... check it out if you're so inclined. It's on BBCA... the episode I'm watching originally aired on 1/11/2013 so I'm guessing it's a new show. Love it!